Uber has gone through a lot of changes over the past year, including a new CEO. But one thing has not changed: The ride-hailing company is still losing a lot of money. Uber posted a net loss of $US1.1 billion in the fourth quarter, according to reports from various news organisations citing sources inside the privately held company. 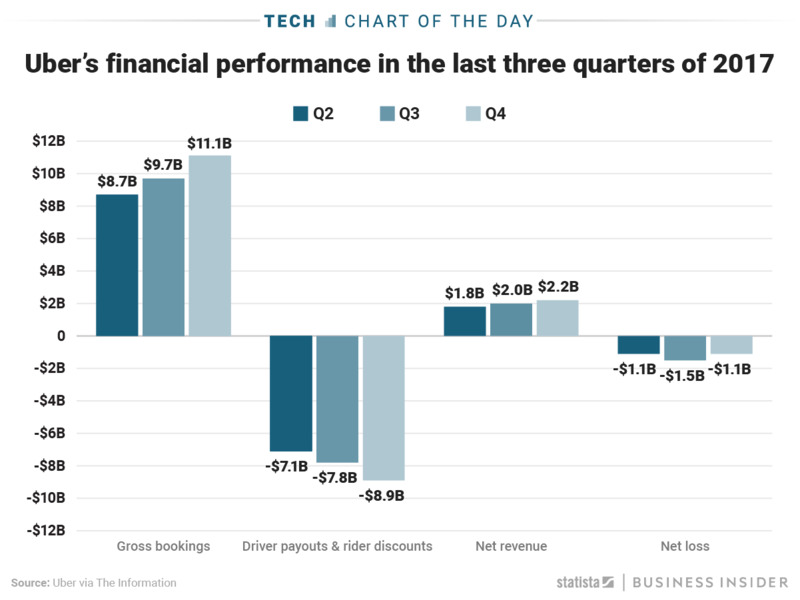 Uber’s bookings and revenue have both grown over the course of the last nine months, as we can see on this chart by Statista. The increasing revenue is a good sign for the business. But as Uber moves closer to a planned 2019 IPO, the company will be under increasing pressure to stop the red ink, which totalled a whopping $US3.7 billion in the past three quarters.